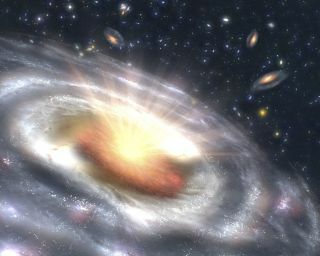 This is an artist's concept of a quasar (bright area with rays) embedded in the center of a galaxy. That global positioning system (GPS) that guides your carand keeps you on the map is itself guided by the positions of some of the brightest,strangest objects in the universe ? quasars. GPS satellites send signals to a receiver in GPSnavigators down on Earth. These in turn calculate your position based onthe location of the satellites and your distance to them. Millions have come to rely on the precision of this systemfor a multitude of purposes, but to provide accurate position readings, the GPSsystem itself has to have a point of reference. "For GPS to work, the orbital position, or ephemeris,of the satellites has to be known very precisely," said Chopo Ma of NASA'sGoddard Space Flight Center in Greenbelt, Md. "In order to know where thesatellites are, you have to know the orientation of the Earth veryprecisely." This can be a tricky prospect because from our perspectiveon Earth, "everything is always moving," Ma said. For example, Earthwobbles as it rotates due to the gravitational pull from the moon and the sun.And even seemingly minor movements, such as shift in air and ocean currents andmotions in the Earth's molten core, all influence the orientation of theplanet. To get a stable reference point, GPS systems have to turn tothe denizens of space. Stars might seem like the obvious signposts to use, sincetheir positions seem so steady to us here on Earth. But they won't work for GPS"because they are moving too," Ma explained. The sun, for example, iscircling the center of our Milky Way galaxy, taking our solar system along withit. What are needed for the job are objects so remote that anymotion they have is undetectable from Earth. They also need to be bright enoughto be seen over the vast distance of space. Quasars, which burn brighter than a billion suns, turn outto be the perfect candidates. Quasars are thought to be powered by giantblack holes feeding on nearby gas. Gas trapped in the black hole's powerfulgravity is compressed and heated to millions of degrees, giving off intenselight and/or radio energy. Most quasarslurk in the outer reaches of the universe, over a billion light years away andso are distant enough to appear stationary from Earth's perspective. A collection of remote quasars, whose positions in the skyare precisely known, forms a map of celestial landmarks in which to orient theEarth. The first such map, called the International Celestial Reference Frame(ICRF), was completed in 1995. It was made over the course of four years andbased on the analysis of the positions of about 600 objects. Ma recently led a three-year effort to update this map andimprove its precision. Called the ICRF2, this new map uses observations of about3,000 quasars with the VeryLong Baseline Interferometer (VLBI). The new quasar observations were able to reduce theuncertainties in the quasar positions to angles as small as 40 microarcseconds? about the thickness of a 0.7-millimeter mechanical pencil lead in Los Angeles as viewed from Washington, D.C. This uncertainty is five times better than theoriginal ICRF. The observations from the VLBI network must be cleaned ofnoise from changes in atmospheric pressure, humidity and changes in thestructure of the quasars themselves. The IAU officially recognized the ICRF2 in August. This quasar map not only helps to guide navigation on Earth,but is also used to help navigate spacecraft on interplanetary missions.Astronomers also use them to guide telescopes and trace the motion of stars andother celestial objects to look for clues to their origin and evolution. The next update to the ICRF might be done from space, withthe planned European Space Agency satelliteGaia that will observe about half a million quasars. That mission, slatedfor launch in 2012, will use quasars that are too dim in the radio part of thespectrum to be seen by the VLBI network.